One of the first things most travelers do after landing to your destination country is exchange money, or make use of your debit/ATM/credit card. This can be a huge expense, especially if you’re careless. A few tips can help you get the best exchange rate and avoid paying high fees. Look at the currency converter for the most up to date exchange rates. When you know the current rate you’ll know what you’re getting into is a good or a bad deal. 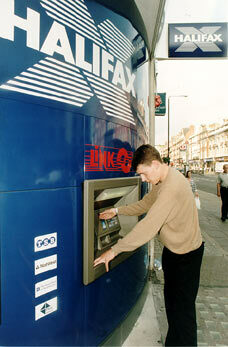 Using your ATM card to get cash from a local ATM will save you from traveler’s check fees and exchange stand fees. Most ATMs will only charge an ATM fee (if any), but will not charge you a percentage fee for the actual exchanging of the money. Don’t go to the ATM and get only a day’s worth of money. Get 2-4 days worth of cash and stash it in various places. Try to figure out exactly how much you need so you won’t have to exchange your money back again. Most ATMs charge fees for withdrawing money in a foreign country and if you withdraw $100 in one day, that ATM will charge the same to withdraw, say, $500 in the same transaction, rather than spending fees on 5 transactions everyday. ING (if you have an ING Electric Orange Checking) and HSBC both have banks in almost every country in Europe. You can use your ATM card at any of their locations and not get charged a fee. Bank of America partners with banks in the UK, France, Germany, Mexico, New Zealand, Australia, and China. Also, if you’re eligible, USAA lets you take money out of any ATM in the world and will reimburse you any fees the ATM charges. Give your local bank a call before you head overseas and ask what their rates are and what they can do for you. They may not be able to prevent fees on your ATM card before you go, but if you call when you get back they will likely remove the fees. You are going to get a worse exchange rate in your country than you will in the country you’re visiting. The exchange kiosks at the airports have terribly high fees. Look for local spots like banks or currency exchange places that offer zero fees and good rates. Banks are your best bet. If you are at a bank/exchange kiosk in another country they post two rates “we buy at” and “we sell at”. “We buy” is when they are buying the the currency (e.g. euros) back from you to your currency (e.g. dollars). “We sell” is when they are taking your dollars and giving you euros. You will want to look at the sell rate when you get there and the buy rate when you are going home. Ideally, you want both of these numbers to be as close to the current exchange rate as possible.